I received this book for free from Frances Lincoln Children's Bks in exchange for an honest review. This does not affect my opinion of the book or the content of my review. Reissue of the first title in the much-loved Little Tim series. A young boy wants to be a sailor, but his parents say he is much too young. Tim grabs the chance to stow away on a steamer, but little does he expect the hard work, stormy sea and sinking ship to come! Little Tim's adventures at sea have delighted generations of children ever since the first book was published in 1936. 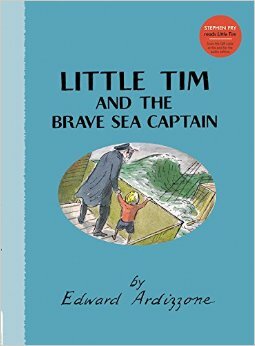 Edward Ardizzone, who illustrated over 170 books in his lifetime, received the prestigious Kate Greenaway medal for Tim All Alone in 1956. When I first received the re- issue set of the Little Tim books by Edward Ardizzone in the mail, my children were immediately drawn in by the beautiful classic illustrations and the bright covers. I took the set to school to try them out on a creative writing class of 5th and 6th graders, curious to see what they would think. They fell in love! We had four of the books and they spent the entire class period reading them thoroughly. We also listened to the audio read along of via QR code in the back. What a great feature! Even though these are geared for children ages 4-7, my older readers ate the series up. They remarked that they loved the setting, the repeating themes, and all wanted to check the books out from me to read later. Overall, I definitely recommend the Little Tim series as a “to purchase” item. These books will be treasured and read over and over again.